On the Author In his review of Cristina Pantoja-Hidalgo's Five Years in a Forgotten Land: A Burmese Notebook (U.P. Press, 1991), Joseph A. Galdon said: "...this collection is a good example of the versatility of the essay form and the writer's voice, honed to perfection by intellectual insight, literary imagination and skill." And Julie Daza wrote: "As a notebook, Five Year On the Author In his review of Cristina Pantoja-Hidalgo's Five Years in a Forgotten Land: A Burmese Notebook (U.P. Press, 1991), Joseph A. Galdon said: "...this collection is a good example of the versatility of the essay form and the writer's voice, honed to perfection by intellectual insight, literary imagination and skill." And Julie Daza wrote: "As a notebook, Five Years is not far from a history book. Ten, twenty years from now the people of Burma will be thankful that once upon a troubled time, a Filipino soulmate was in their midst, sharing their sunlight and starlight and recording her experiences that would soon become part of their history." 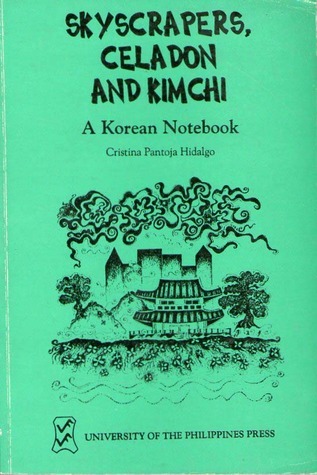 With Skyscrapers, Celadon and Kimchi, Hidalgo does it again, this time focusing on South Korea, where she lived for three-and-a-half years with her husband, then Representative of UNICEF to the country. Her own work with media and the academe, and the trips she took with her husband to different parts of the country, enabled her to experience the country as not many foreigners have. And this book tells that story.